Pioneer Roofing has teamed up with Conklin Roofing Systems, which offers a vast array of products for your roofing needs. From industry leading, environmentally-friendly roof systems for commercial, industrial, agricultural and residential roofs to the highest quality interior/exterior paints and wall mastics avalible for your home or business, Conklin and Pioneer Roofing have what you need. A complete waterproofing system for metal roofs that inhibits rust, stops leaks and provides an energy-efficient, long-lasting and attractive finish coat for years of service. All seams are strengthened with fabric reinforcement embedded into our acrylic elastomeric roof coating. Exposed fasteners are sealed from the elements with premium caulking. 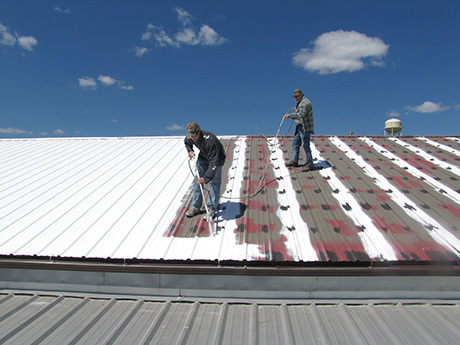 The entire roof surface is protected with one of Conklin's industry-leading roof coatings. The system is an effective method for preserving an existing metal roof without the need for costly metal repair or replacement. Spray Polyyurethane Foam (SPF) is a seamless barrier system that insulates and waterproofs your roof to save energy costs. Many building owners find the system provides a lightweight, reliable barrier that not only withstands the test of time, but is also financially advantagous. Conklin's SPF system delivers countless benefits, ensurung complete satisfaction.